Wondering how to make smoothies, how to blend that perfect combination of smooth and creamy and fresh fruit flavor? Jet's Non Fat Yogurt Smoothie mixes make it easy and delicious without losing the nutritious; packed with vitamin C, Immunity-Aiding prebiotics, all natural fruit purees, and no fat & no cholesterol! 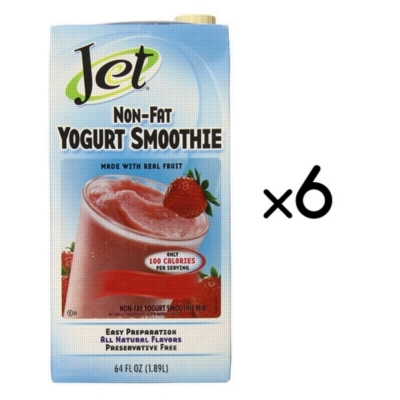 Taste what happens when Jet Smoothie combines your favorite fruit flavors with the wholesome goodness of yogurt. Try all the flavors with this assorted case option! INGREDIENTS: Water, Non-Fat Yogurt (cultured skim milk), Sugar, Peach Puree (water, peach puree concentrate), Pectin, Natural Peach Flavor with other Natural Flavors, Inulin, Citric Acid, Xanthan Gum, Cellulose Gel, Ascorbic Acid (vitamin C), Carrageenan, Cellulose Gum, Annatto Extract (color).